It has now been just over 100 years since the opening of the Paris Peace Conference, which produced the Treaties of Versailles, Saint-Germain-en-Laye, Neuilly-sur-Seine, Trianon, and Sèvres, bringing an end to World War I. To this day, resentment over the Treaty of Trianon fuels Hungarian nationalism and revisionism, particularly under the current government of Prime Minister Viktor Orbán. In 1919, US President Woodrow Wilson's attempt to forge a lasting peace by destroying the world's autocracies proved overly high-minded, even as it inaugurated the interventionist consensus that has dominated US foreign-policy thinking ever since. Though US President Donald Trump claims to have abandoned that tradition, he has nonetheless ordered strikes against government military sites in Syria and recognised Venezuela's opposition leader as the country's legitimate president. The Paris process failed because it set expectations too high. The victory of democratic powers did not mean that democratic wishes would be fulfilled, particularly when those wishes would require the losers to pay. Throughout WWI, every side simply assumed that an eventual peace settlement should saddle the vanquished with the material - and even the emotional - costs of the war, all but ensuring an unsatisfactory resolution to the conflict. Likewise, in 2019, the problems resulting from rapid technological change and globalisation might not admit of any widely acceptable solutions. As a result, different countries will produce their own narratives about being cheated by globalisation. And, as in 1919, they will invent "villains" to bear the blame. For example, the Trump administration routinely complains about China's unfair trade practices, Germany's excessive current-account surplus, aid to developing countries, and so forth. Needless to say, compiling a litany of grievances hardly amounts to a solution. 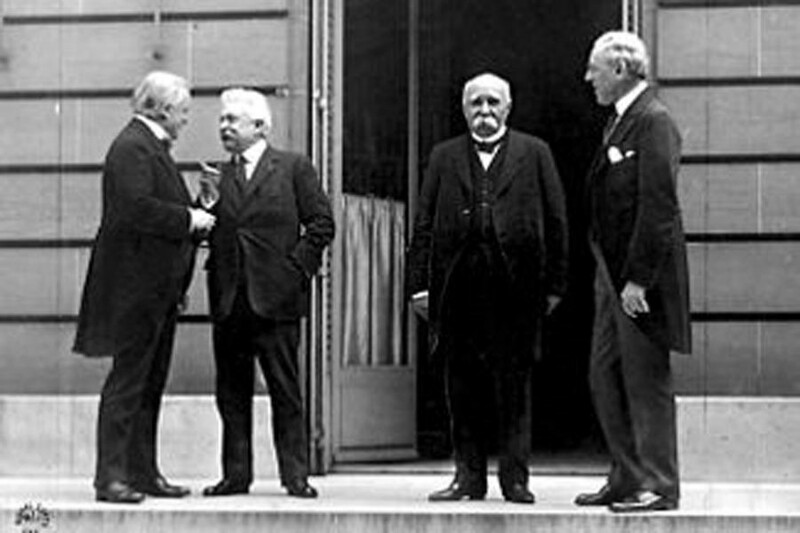 A second explanation for the failure of the Paris process is that some of those involved - French Prime Minister Georges Clemenceau, British Prime Minister David Lloyd George, and Wilson - were uniquely incompetent or otherwise ill-disposed. Clemenceau was a lifelong nationalist, monomaniacally dedicated to the pursuit of French interests, whereas Lloyd George was the opposite, and thus too pliable and unprincipled for the task at hand. He was prone to attacking others personally, only to forget that he had done so when encountering those people again. For his part, Wilson's lofty aspirations far exceeded his acumen for political deal-making, both domestically and internationally. And his mounting health problems certainly didn't help. Owing to his stratospherically high blood pressure, which went largely untreated, Wilson suffered a major stroke shortly after the Paris proceedings. One obvious lesson from this episode in history is that it is important to monitor the physical and mental health of world leaders, particularly the president of the United States, during periods of consequential decision-making. When it comes to leaders' character flaws, 2019 offers just as much fodder as 1919 did. Trump and British Prime Minister Theresa May could not be more different in terms of their personalities, yet both have dispensed with expert advice and done serious damage to their respective countries' political systems. While French President Emmanuel Macron is often criticised for relative inexperience, German Chancellor Angela Merkel is seen as too experienced at preserving an outdated status quo. The third reason the Paris process failed is perhaps the most important. The conference's overly ambitious goals, and the flawed personalities of those pursuing them, were so obvious as to invite a lethal public rebuke. That rebuke came from the British economist John Maynard Keynes, one of the most brilliant minds of the age, in his 1919 book, The Economic Consequences of the Peace. Keynes's critique of the Paris process and its participants was devastating, and he knew it. In October and November of 1919, he attended meetings, hosted by the Dutch banker Gerard Vissering, where bankers from the US and various neutral powers developed a sophisticated plan for leveraging private US finance for the reconstruction of Europe. The plan showed great promise, but Keynes could not associate himself with it, because his brilliant polemic had alienated the political leaders who were needed to carry it out. In the end, only a few elements of the plan were adopted, and not until 1924, when it was already too late. True, Churchill and Roosevelt were far better leaders than Lloyd George and Wilson. But even if they had been just as flawed, Keynes had learned the costs of focusing too much on the foibles of bad leaders during bad times. Whether it is 1919 or 2019, obsessing over individual leaders can distract us from working toward the solutions that today's most pressing problems demand.